The Williams Contractor Safety Leader Award is given to an individual that has proven their strong leadership and safety ideals all year, criteria being crew involvement, strong management and work safety performance. This year’s recipient is Snelson Superintendent Bob Angelocci. Snelson Companies, Inc. 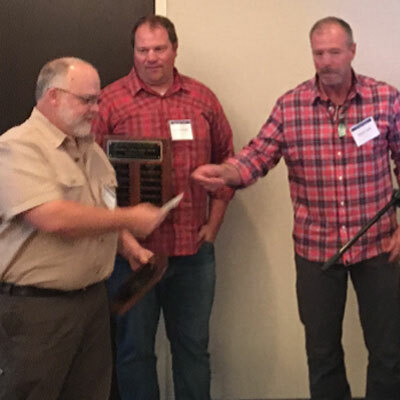 Superintendent Bob Angelocci was selected as the sole recipient of the 2018 Williams Group West Contractor Safety Leader Award at a celebratory banquet for his outstanding role in promoting, supporting and assuring safe pipeline construction work practices. Angelocci manages numerous oil and gas projects for Williams. He was chosen out of a large pool of executives, project managers and foremen from the western U.S. by three Williams Area Chiefs, Kevin Self, Scott Uribe and Jared Knight, for his outstanding safety leadership throughout the year. Nominees for the award are identified by onsite oil and gas pipeline construction managers based on the individual’s work history, safety record and reputation and recognition in the industry as a safety leader among their peers. Snelson’s ongoing commitment to the health and safety of all employees, subcontractors, customers, the public and the environment has led to the achievement of numerous safety awards. Snelson Companies, Inc., a PLH Group Company, is one of the country’s premier contractors for the construction of cross-country oil and gas pipelines, gas distribution networks, stations and facilities and infrastructure integrity services. Williams is an energy infrastructure company that supplies natural gas across North America.